“I’ve just applied for a position of a volunteer writer. This is part of my goal of becoming a professional writer,” said Yooralla customer, Tim. 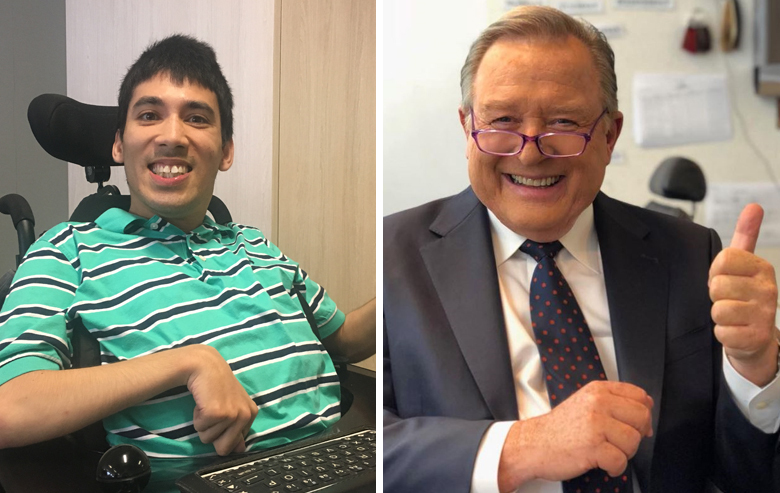 Encouraged by Channel 9 newsreader Peter Hitchener and supported by Yooralla, Tim is confident he will achieve his NDIS goal of becoming a professional writer. “I’ve always wanted to write, but before the NDIS it would’ve been a bit hard for me because with my disability I can’t type fast,” said Tim, a customer at Yooralla’s Community Hub who has cerebral palsy. “Now, through my NDIS plan, I have one-on-one support one day a week, which means my support worker can type what I dictate,” he said. Deo Jr Vinola, Service Leader at the St Albans Community Hub, where Tim attends, said that once Tim’s NDIS plan was approved, the Hub’s team had a meeting to brainstorm how they could best support him to achieve his NDIS goal. “We always work as a team to work out ways we can support all our customers to achieve their NDIS goals. With Tim, we observed that he needed to further develop his writing and editing skills and also to gain more experience that he could add to his resume,” he said. Tim, who attends the Hub every day, was invited to contribute articles to the Hub’s quarterly newsletter that goes out to customers and their families and carers. “I write news stories about what customers do at the Hub; it may be an event, an outing or an activity that we do,” said Tim. To further develop his writing and computer skills, Tim also prepares Power Point presentations for Hub meetings. Tim said that it was his new friend, veteran newsreader Peter Hitchener, who kept him motivated to keep moving towards his dream. “After introducing myself to him at the Royal Melbourne Show we became Facebook friends and now keep in touch online. He always encourages me to keep going. He is a great guy,” said Tim. The Hub’s support workers Sharon Rivas and Vanessa Sampson recently supported Tim to write his resume, featuring his experience writing for the Hub’s newsletter and preparing Power Point presentations. They’ve also supported Tim to apply for local writing volunteer jobs. “I’ve just applied for a position of a volunteer writer. This is part of my goal of becoming a professional writer,” said Tim. 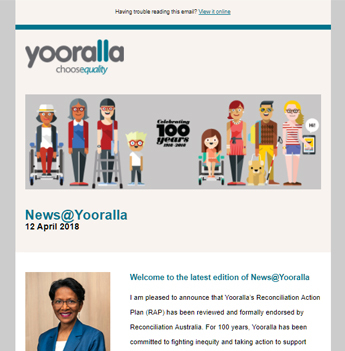 Yooralla has Community Hubs across Victoria, where people with disability can receive the support they require, meet new friends and get out in their local community, all while learning new skills. You can read more about it here.